After a friendly welcome from your Moose guide and a chance to meet your fellow travelers, your tour bus will head north to The Bruce Peninsula. Stop along the way to explore Greig’s Caves, hike to a lookout point and have a picnic lunch, You'll arrive at your accommodations in the afternoon and then spend some time on Miller’s lake – canoeing, kayaking or paddle boarding, before having a BBQ dinner! There’s an exciting day planned as you head right to the Northern Tip of the Peninsula. 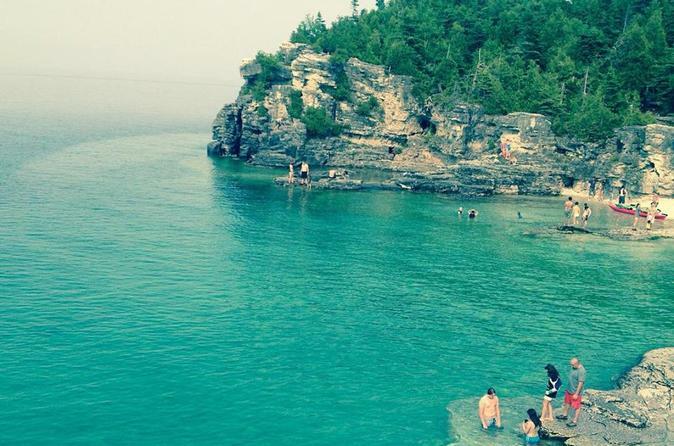 Take a glass-bottom boat cruise to check out some amazing shipwrecks, disembark to explore Flowerpot Island and then take a jet boat back to the mainland. After lunch, you'll head to the grotto with its turquoise waters, where you can swim an underwater tunnel to the caves (or you can enter via dry land). You'll finish the afternoon with a stop at the visitors centre before hiking some of the famous Bruce Trail. Look out for Wildlife! Another group dinner tonight, cooked by your guide. On the last day of your adventure, you'll head back to Toronto. First make a stop at beautiful Sauble beach on Lake Huron for lunch and some relaxing/swimming. At over 7 miles long Sauble Beach is the second longest freshwater beach in the world. You'll arrive back in Toronto around 5pm and be dropped off at your downtown hostel.